This clear coating is used to protect printed pieces. It provides a high-gloss surface that deters dirt and fingerprints. Aqueous coating improves the durability of postcards as they go through the mail, and protects business cards as they ride around in people's pockets. It also looks beautiful on brochures, catalog covers, and stand-alone flyers. Paper that is chemically treated to transfer the impression from the first page to the subsequent pages. See Carbonless NCR Form Printing for more detailed info. To print a single area on the sheet twice so it has two layers of ink. Usually done on soild ink areas to increase the smoothness and/or density. An ink color added to a printed piece in addition to the standard cyan, magenta, yellow and black used in 4 color process printing. Usually a Pantone spot color or custom formulated ink. Requires an extra run through the press on a four color press adding to the cost. Some presses have five units to accommodate fifth colors or clear coatings. Stamping a thin sheet of metallic foil onto a sheet of paper and then embossing a pattern under it, creating a three dimensional raised area, usually text or an image. See a sample of foil embossing. Assembling sheets of paper and signatures into their proper sequence. See also collate. The total number of pages in a book, magazine or publication. Sometimes referred to as the extent. Printed sample made on the press that a project will be printed on to show exactly how it will actually print using the paper, ink and plates to be used for the final press run. A printed area of color created by dots of a certain screen percentage instead of using a layer of solid ink. Frequently used to create a colored area on the sheet, or tint the entire sheet instead of using colored paper. A halftone screen that contains all the same sized dots, or a diluted variation of a full strength color. A spelling mistake in printed material resulting from a mistake in typing or setting type. 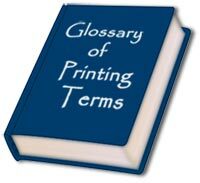 See common printing term misspellings. A very shiny and durable high gloss coating applied to printed material. It is applied as a liquid then cured with ultraviolet light.